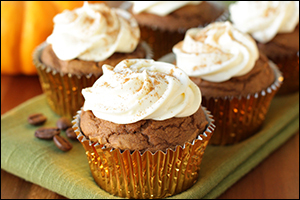 You're not dreaming... We've made guilt-free cupcakes inspired by everyone's favorite seasonal coffee drink. This recipe is a must-make, people! In another large bowl, combine pumpkin with coffee granules, and stir to dissolve. Add remaining cupcake ingredients, and mix until smooth and uniform. Evenly distribute batter among the cups of the muffin pan. Let cool completely, about 10 minutes in the pan and 25 minutes out of the pan. 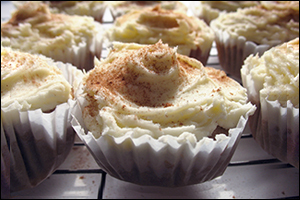 Evenly frost cupcakes, and top with pumpkin pie spice. HG Tip: To make your cupcakes look extra schmancy, apply the frosting with a DIY piping bag. Just transfer the frosting to a plastic bag, and squeeze it down toward a bottom corner. Snip off that corner with scissors, creating a small hole for piping. Ta-da! Click "Send to a Friend," tell your pals you're making a batch, and boom: You won't have to worry about leftovers.